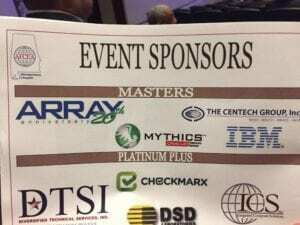 Greenbelt, MD – May 25, 2017 — ARRAY was proud to be a Master Level Sponsor for the Montgomery IT Summit (MITS) 2017. Hosted by the Montgomery AFCEA Chapter, this event allows attendees to engage with speakers, panel members, and other Government and Industry leaders in understanding how the Government can work with their contractor partners to deliver collaborative IT solutions and make them operational in a timely and effective manner for the Warrior. The theme for this year’s event was “Accelerating Data Driven Decisions”. ARRAY’s Senior Client Executive, Brian Knott, is President of the Montgomery AFCEA chapter and presided over the Summit’s activities. In addition, ARRAY provided sponsorship for the Annual Montgomery AFCEA Charity Golf Tournament. The proceeds of the tournament benefit the Montgomery AFCEA Chapter Educational Foundation. Since its inception, the Educational Foundation has invested over $3 million dollars in scholarships and other benefits for Montgomery area students, helping to transform Montgomery into one of the fastest growing centers of technical excellence in the Southern United States. 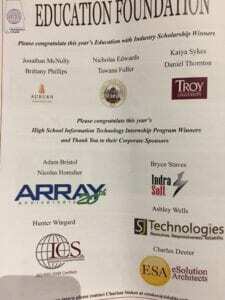 An additional part of ARRAY’s support for future industry and DOD leaders, and in concert with the AFCEA Montgomery Education Foundation, ARRAY is continuing its support for the IT High School Intern program through the support of two interns in our Montgomery, AL office. “ARRAY has always felt that a core part of our mission as a company is to ensure we provide opportunities and support for our future leaders”, said Brian Knott. Now celebrating its 20th Anniversary, ARRAY has received national and regional awards for its growth achievements, bringing the capability and the leadership of a large business but retaining the agility of a small business. ARRAY has also obtained critical ISO and CMMI certifications, and is continuously focused on improving quality management to ensure that products and solutions meet only the highest quality standards in the industry.